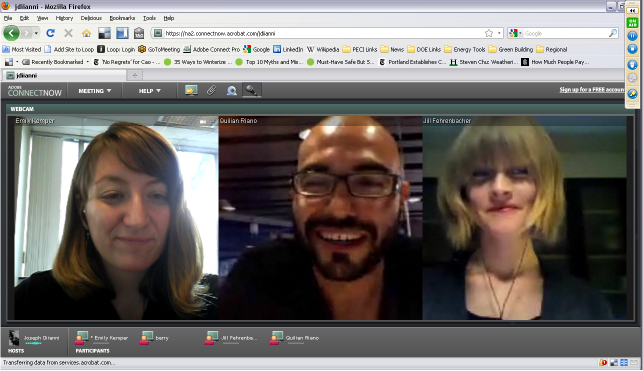 From left to right, moi, Quilian from Archinect, and Jill from Inhabitat. Not shown are Barry, our instigator, Joel, our moderator who was actually in Phoenix, and Cameron, the founder of Architecture for Humanity, who was having some technical difficulties. The panel, despite an audio delay and some serious bandwidth issues in all four corners, was more or less a success, if for no other reason than we conducted a nearly carbon-free conference session! Think of all the carbon that was saved by all of us not flying to Phoenix. This was a big incentive to doing this presentation, and if it was going to happen, GreenBuild was the place. I do want to mention, however… when I get in situations like today’s panel, I have no idea what I’m saying. I was trying so hard to hear the questions, and to concentrate over the sound of the audio echoing, that my mental “filter”, which is usually fairly porous to begin with, was almost nonexistent. Therefore I just want to say, once again, THANK YOU to everyone in the audience who sat through it! I hope you got something out of it. And I hope you can agree with me and my internet friends* when we say that the Web will certainly play a part in the way that designers operate going forward… even if it will take some time to work out the kinks. Many of the top class ads on TV and the Internet, as suggested in the blog post have been done by some of the most creative minds in the film industry. But that doesn’t mean others cannot make equally compelling ads that touch people with their simplicity. Many of the extraordinary websites and blogs in our directory, Climatarians, have been in fact put up by ordinary people.